You can find me on LinkedIn for details about my education, job history, and community service. My preparation for ministry included not only completing the Master of Divinity degree, but service learning in a community agency serving homeless people, an intensive chaplaincy stint at a regional hospital, and an internship in a Unitarian Universalist congregation. I also served in campus ministry and as a church membership coordinator before settling into parish ministry in 2016. I answered the calling to ministry after a career in the non-profit sector spanning over a decade. In addition to serving as executive director or CEO of two community foundations in Indiana, I led fund development for a meditation center in California and a Midwestern land trust. Earlier, I was a consultant in the field of community and economic development, facilitating collaborative projects in communities and helping organizations build strong leadership teams. My first graduate degree was in sociology. My personal passions have included racial justice, passage meditation, singing in an innovative community choir, and the study and practice of principled nonviolence (a la Gandhi and King). It has been my delight to share these interests with others through groups and classes. As a volunteer, I have also served on several boards of directors that reflect my passions: supporting the missions of a community choral group, my home congregation, and a food co-op. 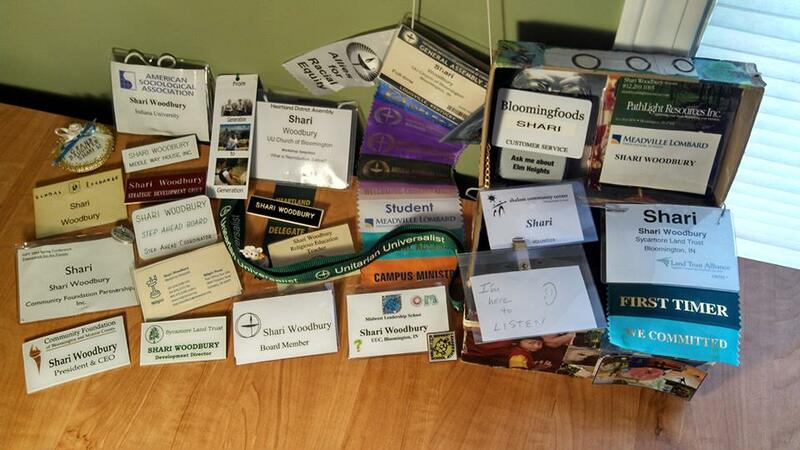 A picture I once snapped of my name tag collection, which offers a glimpse of the many roles in my life leading into ministry.